This guy had swapped out the original two-cylinder engine for a turbo I-4 from a VW Jetta. 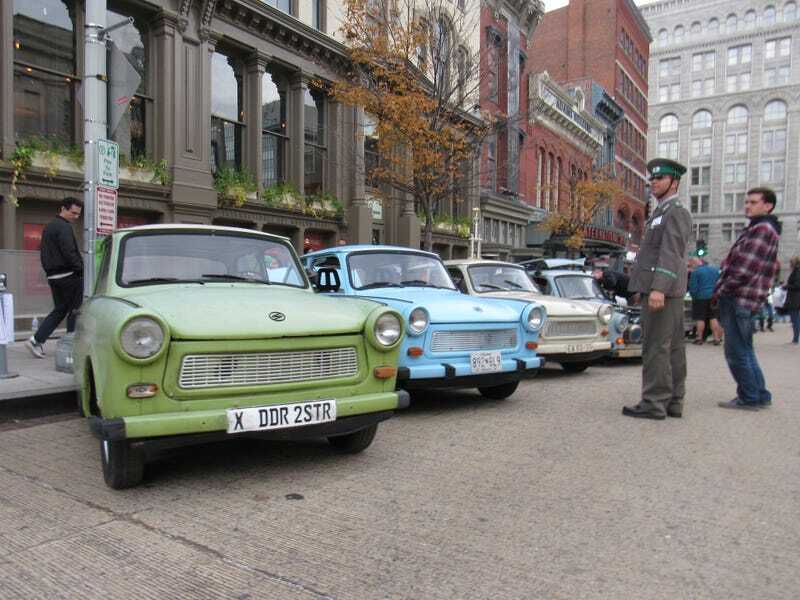 Other modifications had turned the little Trabi into a full-fledged racer. I got a ride in this one two years ago. Lada! This was in absolutely pristine condition. A Barkas B1000, with a military Trabant in its bed. One of them going out on the road. An FSO Syrena showed up, driven all the way from Ontario. Cyrillic writing on the Lada’s rear window. Another shot of the FSO. This pristine light-blue Trabi won best-in-show. This guy was clearly a restoration project, with two flat tires and a roof held on with a bungee cord. A pic of the Jag inside the museum, from one of the James Bond movies. In addition to all the cars there, there was a Trans Am parked right around the block. After it ended, I drove to Gravelly Point Park near Reagan Airport, and decided to do some planespotting.